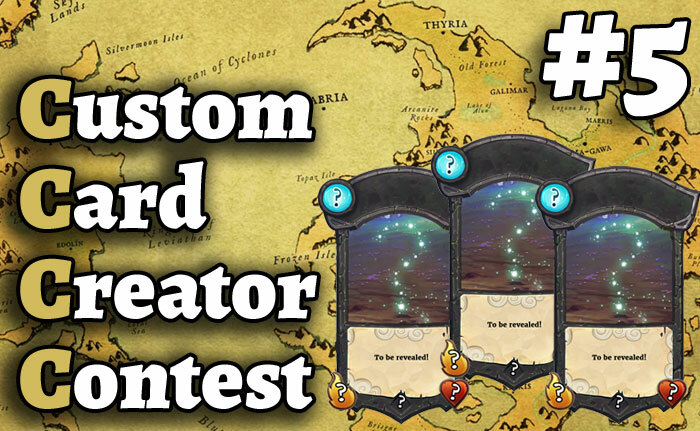 The fifth custom card creator contest focused around exploring the world of Faeria. Why hello there. I'm pretty excited to announce the fifth custom card creator contest! We're going to have a lot of fun. I have an intriguing and special rule this time around, and I believe you will greatly enjoy it. So without further ado, lets start this thing off! We have an awesome rule this contest, so pay close attention! Its a little complex, but I'm sure you'll get the hang of it. Here's a map of the known Faeria world (I've heard there is still much to explore). Select one of the cities on the map. Make a card centered around the city you chose! For example, I chose the city Aernost, what I imagine to be a shipping port for the castle and all of Meroval. This means there are many bandits, thieves, evildoers lurking, and sharks circling, all wanting a little bit of the goodies. Of course you don't have to do just one card. You can do a set! Please specify the city you chose and why you chose it at the bottom of the form. All you have to do is make a card from the website below that best follows the three contest rules. That's it! Be like goldilocks - Not too weak, not too strong, but just right. Will be judged out of 10 points. You know what happens when you pop a bubble full of ideas? Creativity juice breaks free. Pop your idea bubble and get those trapped creative juices flowing. Will be judged out of 30 points. Use the special rule in the most ceative way possible. This is the most important part of your card and will be judged out of 40 points. Submit your cards here. Beware, I am not an easy judge! The three best cards will be awarded with ingame rewards! Isn't that fascinating? Thank you for providing us with prizes Atmaz and the Abrakam team!